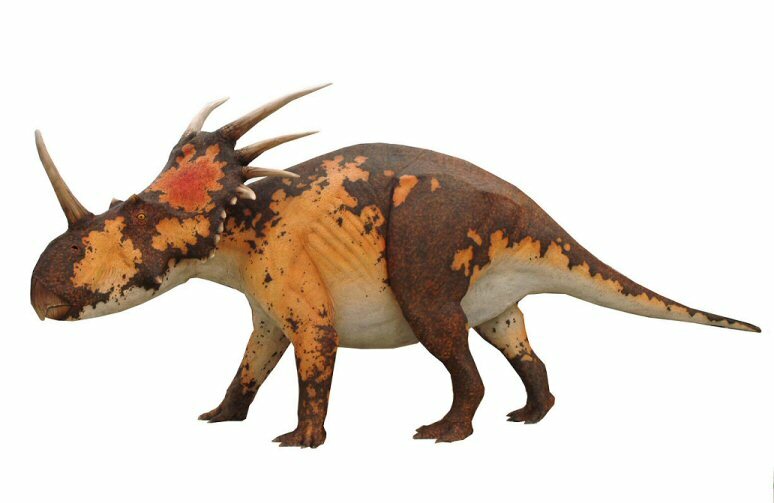 ANATOMYStyracosaurus was a dinosaur that walked on four short legs. This large plant-eater had a six-spiked frill projecting from the back of its skull. It also had an upward-pointing horn on its nose (2 feet (60 cm) long and 6 inches (15 cm) wide), and two small horns above its eyes. These spikes and the horn probably provided protection from predators, and were possibly used in mating rituals and rivalry. It had a short, thick, pointed tail, a large, bulky body, a large skull and a beak. Styracosaurus hatched from eggs. Styracosaurus was about 18 feet (5 m) long, 6 feet (1.8 m) tall, and weighed up to 3 tons. 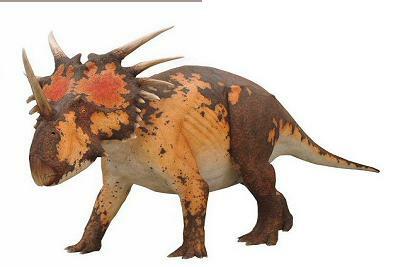 Styracosaurus lived in the late Cretaceous period, about 77-70 million years ago. It was among the last of the dinosaur species to evolve before the Cretaceous-Tertiary extinction 65 million years ago. Among the contemporaries of Styracosaurus were Tyrannosaurus rex, Ankylosaurus (an armored herbivore), Corythosaurus (a crested dinosaur), and Dryptosaurus (a meat-eating dinosaur). When threatened by predators, Styracosaurus may have charged into its enemy like a modern-day rhinoceros does. This would have been a very effective defense. Styracosaurus was a ceratopsian, whose intelligence (as measured by its relative brain to body weight, or EQ) was intermediate among the dinosaurs. Styracosaurus probably ate cycads, palms, and other prehistoric plants with its tough beak. It could also chew well with its cheek teeth (like other ceratopsians, but unlike most other dinosaurs). Styracosaurus Styracosaurus walked on four short legs; it may have been a relatively fast dinosaur, perhaps running at up to 20 mph (32 kph). Dinosaur speeds are estimated using their morphology (characteristics like leg length and estimated body mass) and fossilized trackways. 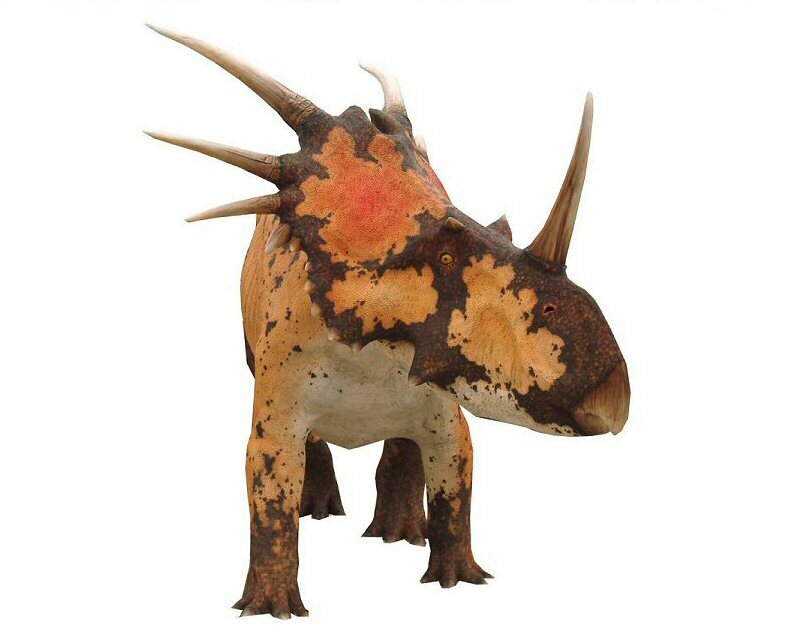 Styracosaurus was named in 1913 by L. M. Lambe from a fossil found near Alberta, Canada. Fossils have been found in the USA and Canada. A bonebed of about 100 Styracosaurus fossils was found in Arizona, USA, indicating that they traveled in herds. Styracosaurus was a late ornithischian dinosaur, the order of bird-hipped, herbivorous dinosaurs. It was a member of the suborder Marginocephalia, and of the family of large, horned, frilled, herding herbivores, the ceratopsians. The ceratopsians were one of the last major groups of dinosaurs to evolve, and include Psittacosaurus, Leptoceratops, Pachyrhinosaurus, Montanoceratops, Chasmosaurus, Centrosaurus, Triceratops, Styracosaurus, Protoceratops, and others.